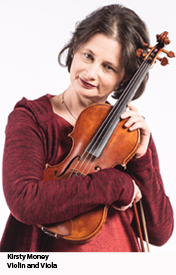 Kirsty Money began playing the violin in Victoria BC, finishing her studies in1988 with Sydney Humphreys at the Victoria Conservatory of Music. She went on to complete her BMus at McGill University in 1992, and MMus in Performance and Literature at The University of Western Ontario in 1997. Since 1999 she has been a member of the first violin section of Symphony Nova Scotia. However, modern violin is not the only instrument Kirsty plays! While studying in Montréal, she was introduced to the baroque violin, playing with Joel Thiffault and L’Orchestre Baroque de Montréal, the emerging baroque orchestra in the city at this time. Since then she has always enjoyed playing and studying Early Music, and this has led her to play baroque violin and viola with numerous groups and Early Music Artists, including: crossover baroque/folk violinist David Greenberg (Tempest Baroque Ensemble), countertenor Daniel Taylor (The Theatre of Early Music), soprano Suzie Leblanc (Le Novel Opera), violinist Kevin Mallon (Aradia Ensemble), folk flutist Chris Norman (Boxwood Music Festival, Lunenburg NS), violinist Jeanne Lamon (Tafelmusik), organist, composer and conductor Paul Halley (Kings College Chorus, Halifax), violinist Adrian Butterfield (London Handel Players), recorder player Francis Colpron (Les Boréades), recorder player and conductor Matthias Maute (Ensemble Caprice), harpsichordist and conductor Alex Weimann (Pacific Baroque Orchestra), UK based harpsichordist and conductor Steven Devine, and most recently with violinist Kati Debretzeni (English Baroque Soloists) and the Victoria Baroque Players. In addition to these instruments, Kirsty also plays the nyckelharpa, an instrument that dates back to Medieval Northern Europe. Through grants from Arts Nova Scotia and The Canada Council she has studied this instrument and its repertoire for the past two years in Sweden, Germany and the UK.